My tomato seeds were sown in Rockwell starter cubes 7 days ago and most are progressing well. After 4 days in a heated propagator 65% of the tomato seeds had germinated. After a week this has risen to an 87% seed germination rate. At four days most of the the seedling started to appear. The cotyledon (seed leaf) is hidden under the seed casing. Once the seedlings are at this stage they can be moved from the dark to the light, still under the perspex cover. I use Lightwave T5 lights to provide consistent light for around 18 hours a day, with 6 hours of darkness. 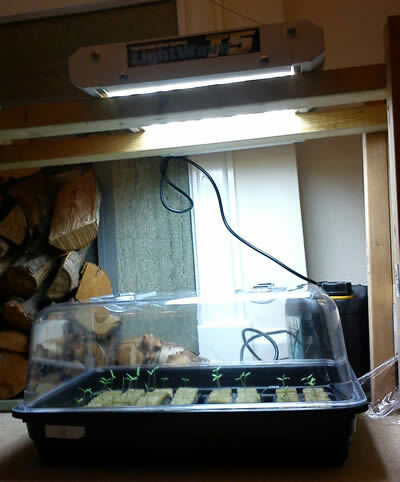 Initially the lights are placed reasonably high away from the delicate seedlings. Putting the lights too close too early can scorch the seedlings. Here are the tomato seedlings that were sown 7 days ago. You can see the remains of a seed shell on the left tip of the middle plant in the photo.At this stage most of them have been under lights for 3 days. The seed leaf (cotyledon) is clearly visible and is the first leaf to appear. The seed leaf looks pretty much the same for all plants. It’s the first true leaf (yet to appear) which really allows identification of different plants and varieties. 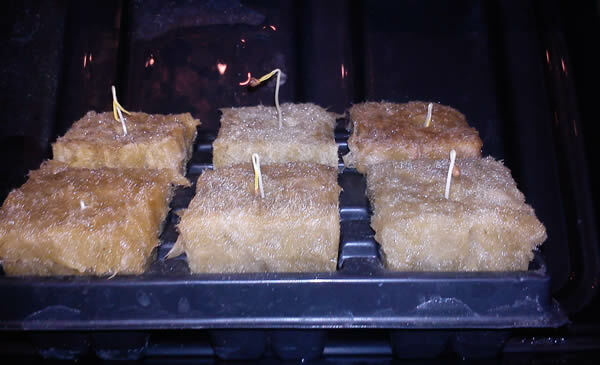 The germinated tomato seedlings now need nutrient – Formulex is still being used at this stage to keep the rockwool starter cubes moist. Once the first true leaf appears then we will have to think about moving the seedlings to the 75mm cubes. So how am I doing on tomato seed germination rates? The table below shows the rate by variety. For my 2013 growing plan I need an overall 84% tomato seed germination rate to get to my target number of tomato seedlings so at 87% we are well on track. I am going to leave the 7 seeds that have not germinated in the heated propagator, to see if they are just late starters. After 14 days, if they have not germinated, then I will probably discard them. Whilst this is a small sample of each variety it does seem to indicate that Pink Brandywine and Alicante germinate earlier than some of the other varieties. The Matt’s Willd Cherry are the oldest seeds at 3-years old but I don’t know whether this explains the slightly later germination. More on this next week. In the second batch of seeds, planted today, are 20 x Alicante, 2 x Rosada (the packet of six seeds actually came with eight) and 28 x Gardeners Delight. Since there has been 100% germination on the Alicante and the Rosada so far, the target of 84% should be achieved. 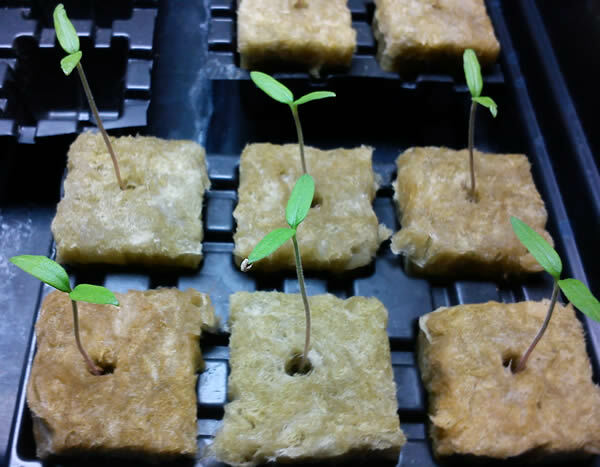 See earlier diary entry on Sowing Tomato Seeds in Rockwool.